3 3 Medigap Insurance require daily skilled care in a nursing home. Because Medigap policies only pay for services covered by Medicare, the Medigap coverage is also limited. Part B: Deductible (included in plans C, F, and J). This benefit pays for the first $124 of Medicare-covered medical services in each calendar year. Although this benefit is very popular, it is likely to cost as much as or more than the maximum benefit you can receive. Foreign travel emergency (included in plans C through J). 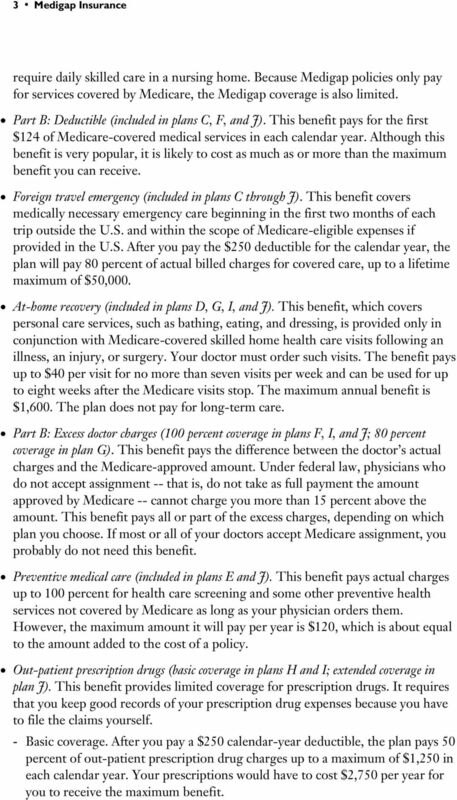 This benefit covers medically necessary emergency care beginning in the first two months of each trip outside the U.S. and within the scope of Medicare-eligible expenses if provided in the U.S. After you pay the $250 deductible for the calendar year, the plan will pay 80 percent of actual billed charges for covered care, up to a lifetime maximum of $50,000. At-home recovery (included in plans D, G, I, and J). This benefit, which covers personal care services, such as bathing, eating, and dressing, is provided only in conjunction with Medicare-covered skilled home health care visits following an illness, an injury, or surgery. Your doctor must order such visits. The benefit pays up to $40 per visit for no more than seven visits per week and can be used for up to eight weeks after the Medicare visits stop. The maximum annual benefit is $1,600. The plan does not pay for long-term care. 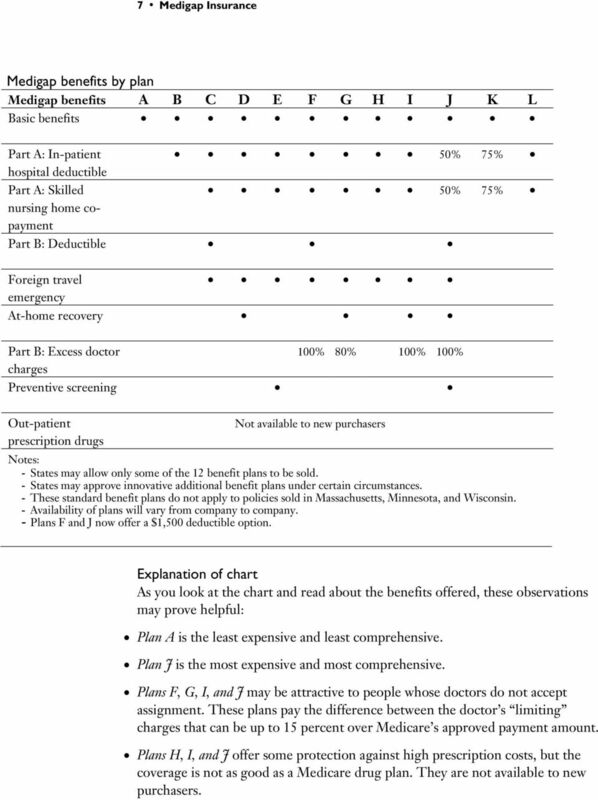 Part B: Excess doctor charges (100 percent coverage in plans F, I, and J; 80 percent coverage in plan G). This benefit pays the difference between the doctor s actual charges and the Medicare-approved amount. Under federal law, physicians who do not accept assignment -- that is, do not take as full payment the amount approved by Medicare -- cannot charge you more than 15 percent above the amount. This benefit pays all or part of the excess charges, depending on which plan you choose. If most or all of your doctors accept Medicare assignment, you probably do not need this benefit. Preventive medical care (included in plans E and J). This benefit pays actual charges up to 100 percent for health care screening and some other preventive health services not covered by Medicare as long as your physician orders them. However, the maximum amount it will pay per year is $120, which is about equal to the amount added to the cost of a policy. 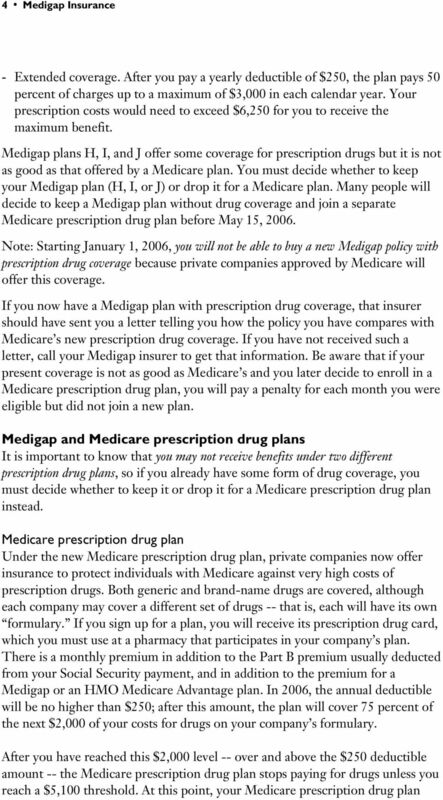 Out-patient prescription drugs (basic coverage in plans H and I; extended coverage in plan J). This benefit provides limited coverage for prescription drugs. It requires that you keep good records of your prescription drug expenses because you have to file the claims yourself. - Basic coverage. After you pay a $250 calendar-year deductible, the plan pays 50 percent of out-patient prescription drug charges up to a maximum of $1,250 in each calendar year. Your prescriptions would have to cost $2,750 per year for you to receive the maximum benefit. 6 6 Medigap Insurance policy, you will be paying for $120 worth of health screening and preventive health services, regardless of whether you use them. 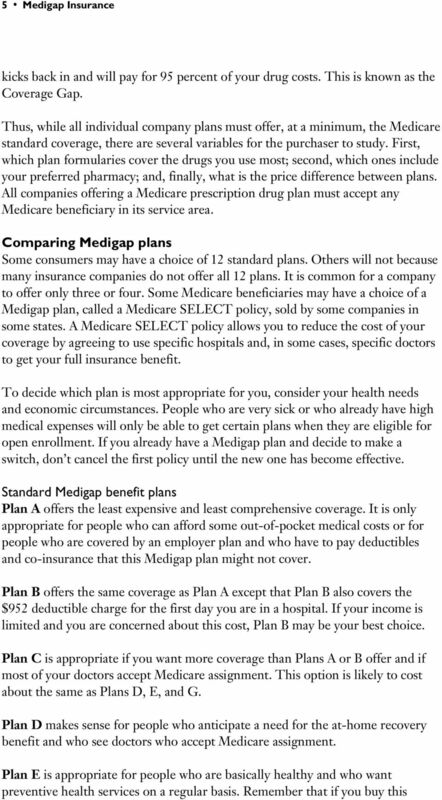 Plan F makes the most sense for people who see doctors who do not accept Medicare assignment. Keep in mind that doctors are prohibited from charging more than 15 percent above the Medicare-approved amount. If your costs for these charges are relatively small or most of your doctors take assignment, you may be better off with a different plan. Plan G is appropriate for consumers whose doctors don t accept Medicare assignment and who also want the at-home recovery benefit. Only 80 percent of the excess doctor charges are covered under this plan, and the Part B deductible ($124) isn t covered either. The cost of this plan is comparable to Plans C, D, and E. Plan H is usually the least expensive plan offering prescription drug coverage. The drug benefit is limited; you will be reimbursed for no more than 50 percent of your prescription drug bills, and the maximum reimbursement is $1,250. * Plan I is more expensive than Plan H because it also includes coverage for excess doctor charges and the at-home recovery benefit. * Plan J is the most comprehensive and expensive plan available and includes all the possible benefits in the plans discussed above. This plan is appropriate only for people who can afford the cost. * Plans K and L were new in 2005 and are not yet widely available. They are discussed under a separate heading below. * Plans H, I, and J are not available to new purchasers because better drug coverage is available through the new Medicare prescription drug plans. You may keep one of these policies for its other benefits and drop only the prescription drug portion of coverage. You will then want to enroll in one of the Medicare prescription drug plans. 7 7 Medigap Insurance Medigap benefits by plan Medigap benefits A B C D E F G H I J K L Basic benefits Part A: In-patient 50% 75% hospital deductible Part A: Skilled 50% 75% nursing home copayment Part B: Deductible Foreign travel emergency At-home recovery Part B: Excess doctor 100% 80% 100% 100% charges Preventive screening Out-patient Not available to new purchasers prescription drugs Notes: - States may allow only some of the 12 benefit plans to be sold. - States may approve innovative additional benefit plans under certain circumstances. - These standard benefit plans do not apply to policies sold in Massachusetts, Minnesota, and Wisconsin. - Availability of plans will vary from company to company. 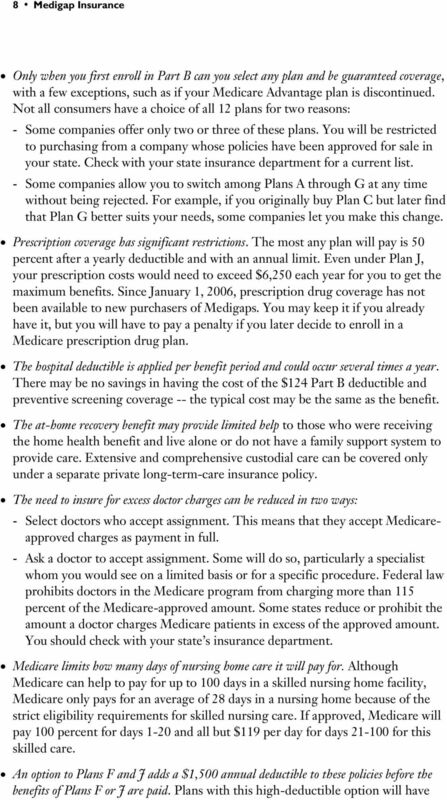 - Plans F and J now offer a $1,500 deductible option. Explanation of chart As you look at the chart and read about the benefits offered, these observations may prove helpful: Plan A is the least expensive and least comprehensive. 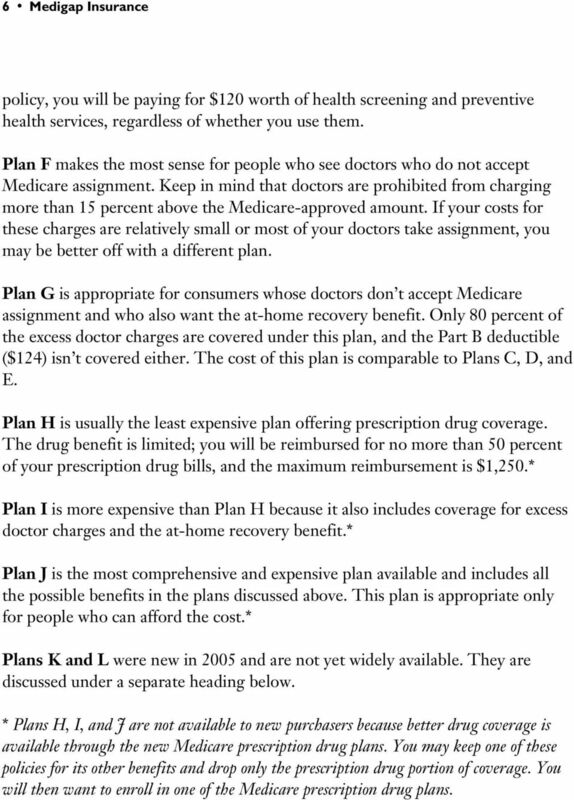 Plan J is the most expensive and most comprehensive. Plans F, G, I, and J may be attractive to people whose doctors do not accept assignment. These plans pay the difference between the doctor s limiting charges that can be up to 15 percent over Medicare s approved payment amount. Plans H, I, and J offer some protection against high prescription costs, but the coverage is not as good as a Medicare drug plan. They are not available to new purchasers. 9 9 Medigap Insurance lower premiums. However, this option may not be approved in all states. 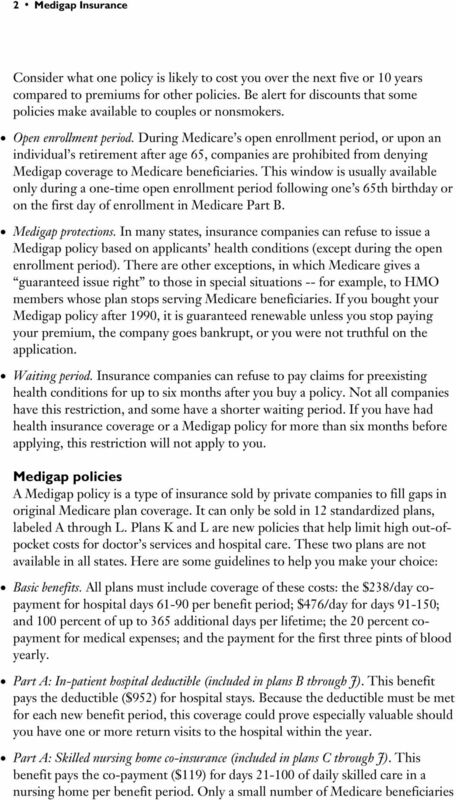 It is important to remember that if Medicare does not pay for a service, your Medigap policy will not pay either. 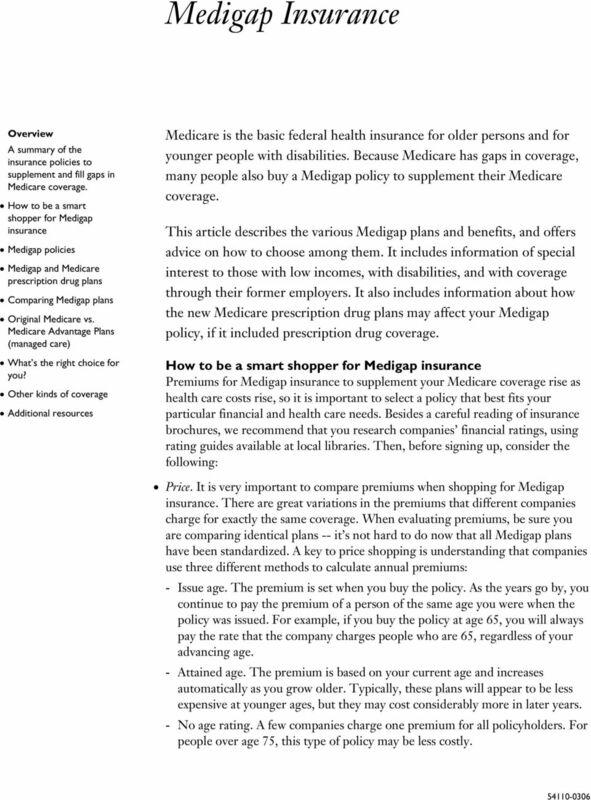 Medigap pays only after Medicare has paid the approved amount of the charge. Retiree plans may be significantly different than a Medigap policy. Check with your plan administrator for more information. Medigap Plans K and L Both plans include the basic benefits: $238/day co-payment for hospital days 61-90; $476/day for days ; and 100 percent of up to 365 additional days per lifetime; the 20 percent co-payment for medical expenses; and the payment for the first three pints of blood yearly. In addition: Plan K Pays 50 percent of the in-patient hospital deductible (per benefit period); in 2006, this deductible is $952. Pays 50 percent of co-payment for skilled nursing facility care for days 21 through 100; the co-payment is $119 per day in Pays 100 percent co-insurance for Part B preventive medical care. Pays 50 percent of hospice cost-sharing for all Part A Medicare covered expenses and respite care. Once you meet the annual Part B deductible of $124 and reach $4,000 in annual out-of-pocket co-insurance charges, the plan pays 100 percent of Medicare Part A and Part B co-insurance and deductibles for the rest of the calendar year. 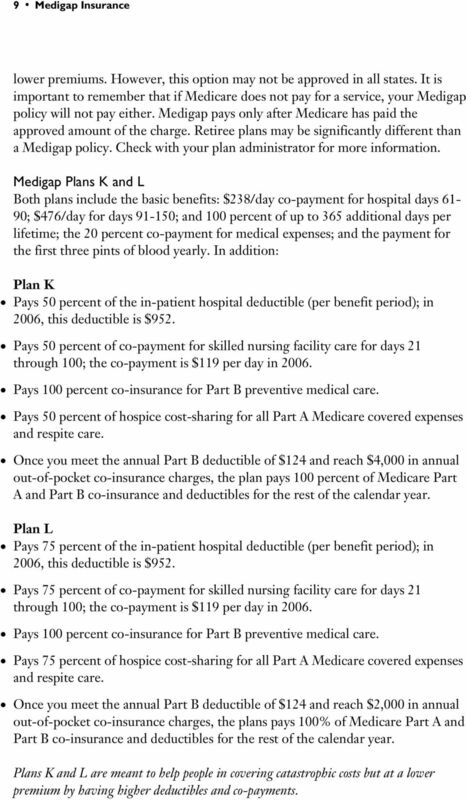 Plan L Pays 75 percent of the in-patient hospital deductible (per benefit period); in 2006, this deductible is $952. Pays 75 percent of co-payment for skilled nursing facility care for days 21 through 100; the co-payment is $119 per day in Pays 100 percent co-insurance for Part B preventive medical care. Pays 75 percent of hospice cost-sharing for all Part A Medicare covered expenses and respite care. Once you meet the annual Part B deductible of $124 and reach $2,000 in annual out-of-pocket co-insurance charges, the plans pays 100% of Medicare Part A and Part B co-insurance and deductibles for the rest of the calendar year. Plans K and L are meant to help people in covering catastrophic costs but at a lower premium by having higher deductibles and co-payments. 11 11 Medigap Insurance disenrolled from your present HMO. You are allowed to participate in only one Medicare prescription drug plan at a time. What s the right choice for you? 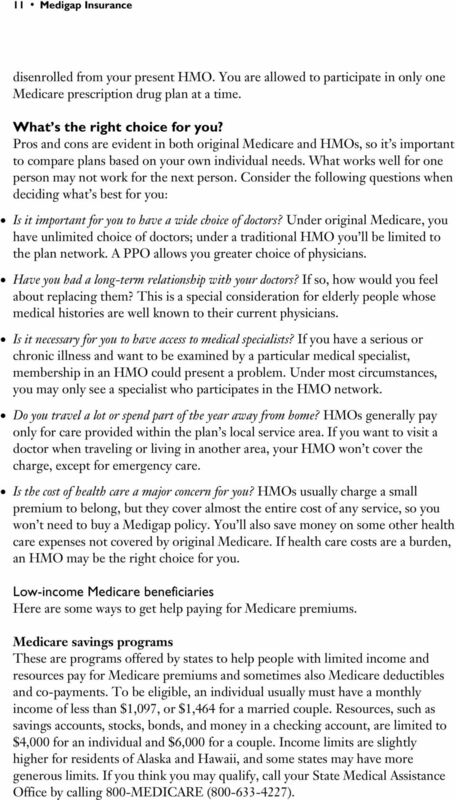 Pros and cons are evident in both original Medicare and HMOs, so it s important to compare plans based on your own individual needs. What works well for one person may not work for the next person. Consider the following questions when deciding what s best for you: Is it important for you to have a wide choice of doctors? 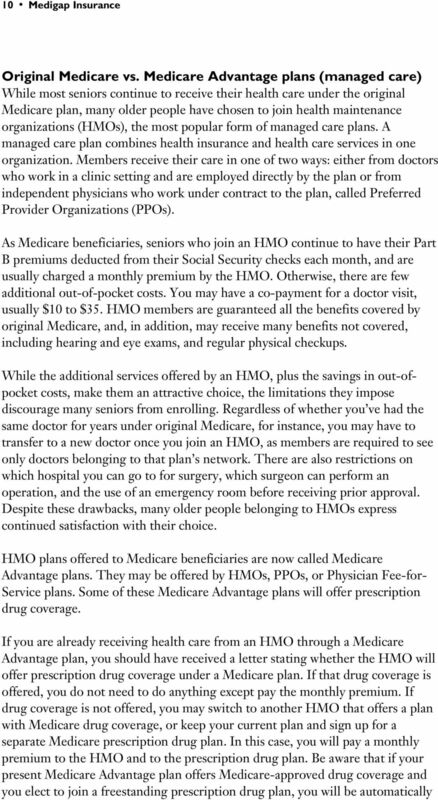 Under original Medicare, you have unlimited choice of doctors; under a traditional HMO you ll be limited to the plan network. A PPO allows you greater choice of physicians. Have you had a long-term relationship with your doctors? If so, how would you feel about replacing them? This is a special consideration for elderly people whose medical histories are well known to their current physicians. Is it necessary for you to have access to medical specialists? If you have a serious or chronic illness and want to be examined by a particular medical specialist, membership in an HMO could present a problem. Under most circumstances, you may only see a specialist who participates in the HMO network. Do you travel a lot or spend part of the year away from home? HMOs generally pay only for care provided within the plan s local service area. If you want to visit a doctor when traveling or living in another area, your HMO won t cover the charge, except for emergency care. Is the cost of health care a major concern for you? HMOs usually charge a small premium to belong, but they cover almost the entire cost of any service, so you won t need to buy a Medigap policy. You ll also save money on some other health care expenses not covered by original Medicare. If health care costs are a burden, an HMO may be the right choice for you. 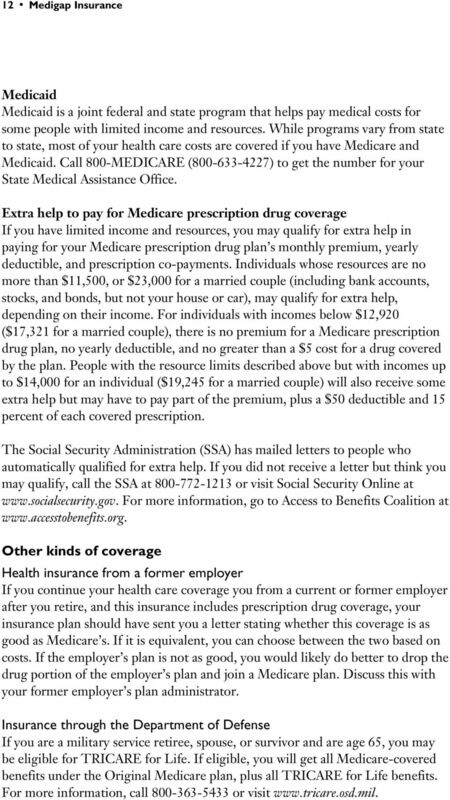 Low-income Medicare beneficiaries Here are some ways to get help paying for Medicare premiums. 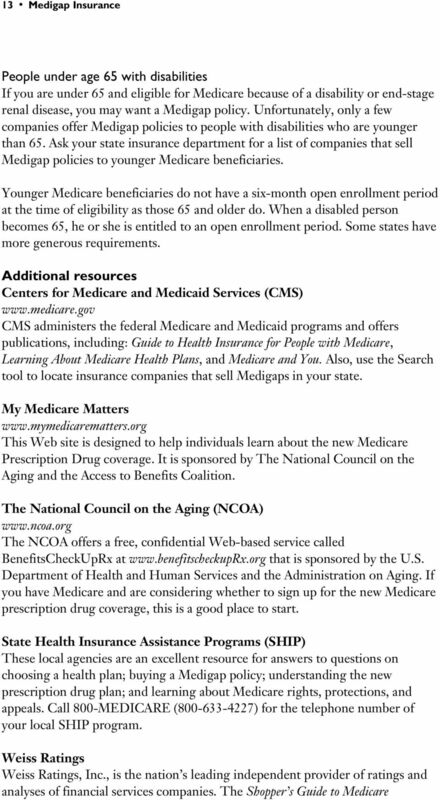 Medicare savings programs These are programs offered by states to help people with limited income and resources pay for Medicare premiums and sometimes also Medicare deductibles and co-payments. To be eligible, an individual usually must have a monthly income of less than $1,097, or $1,464 for a married couple. Resources, such as savings accounts, stocks, bonds, and money in a checking account, are limited to $4,000 for an individual and $6,000 for a couple. Income limits are slightly higher for residents of Alaska and Hawaii, and some states may have more generous limits. If you think you may qualify, call your State Medical Assistance Office by calling 800-MEDICARE ( ). 14 14 Medigap Insurance Supplement Insurance ($49 plus shipping and handling) has price comparisons for Medigap insurance based on your age, gender, and zip code. Obtain a copy by visiting or by calling The National Council on the Aging, Inc. All rights reserved.